Trying to eat low carb is easier said than done, especially if you have a sweet tooth like me. I tend to crave sugar in the late afternoons and evenings, and I’m not always disciplined enough to stay away from it. Fortunately, I’ve discovered a secret to making easy and guilt-free desserts and treats that last all week– Sugar Free Jell-O!! Both the gelatin and the pudding. And, they come in so many different flavors, you can make something new and exciting every week. 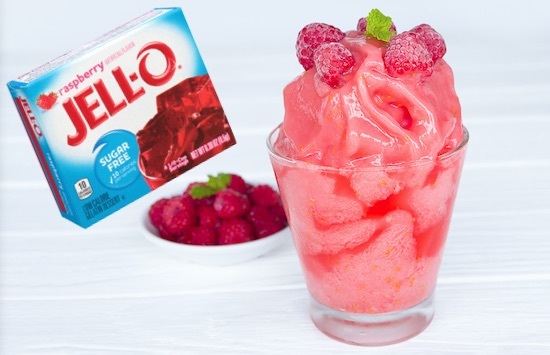 Here is a round-up of my favorite Low Carb desserts using sugar-free Jell-O. I’m certain you’ll find something that will satisfy that relentless sweet tooth! This delicious and easy cold treat will make you feel like you’re cheating, but it has less than 1 carb and is unbelievably low in calories. Pour the dry gelatin into a medium size bowl. Add 1/3 cup boiling water and stir until the gelatin is well dissolved. Add 1/3 cup of very cold water and 1 tbsp of heavy whipping cream, and stir. Place 1.5 cups of ice into a good quality blender and pour the gelatin mixture over the ice. Feel free to add a dash of low carb sweetener, vanilla extract, frozen berries or other flavorings depending on the gelatin you choose. This easy recipe only requires 2 simple ingredients and doesn’t require any baking. Whip them up in just a few minutes for the perfect mid-day sweet tooth attack. Yes, please! This easy dessert recipe only requires a handful of ingredients, and you simple stir and then chill. I like the sound of that. This is my go-to recipe for those days when I’m craving something sweet and want to whip up something tasty in just a few minutes. It only requires 2 ingredients, and will last you the entire week (unless your husband gets ahold of it). If you’re looking for something a little different with an amazing texture, look no further! This easy meringue recipe using any flavor of gelatin you’d like will have you coming back for seconds. This easy recipe is similar to the mousse pudding but with a little different texture and flavor. It only requires 3 simple ingredients, and you won’t be disappointed! Now, THIS is my idea of a salad!! I’m actually not sure what makes it a “salad”, except for maybe the addition of chopped pecans, but it sure does look amazing. You could even add in a few berries to the mix and still keep it relatively low carb. Hello, summer time! I can certainly imagine myself enjoying one of these Jell-O popsicles by the pool… guilt-free! Whip them up in any flavor you’d like with just 2 simple ingredients. If you like candy, but are trying to stay away from sugar, you are going to love these creamy little yogurt bites! They really hit the spot when your sweet tooth attacks. Once chilled, you can store them in the fridge and pop them in your mouth whenever you desire. I’m always looking for new ways to cook and enjoy eggs, and recently discovered that I actually like them best like this!